1.5 months ago I posted a photo of myself because I went on a quest to losing weight which is one of the steps I am taking to a better me. Today, I'm posting a new photo and I hope that it will show that there has been a bit of an improvement. The one in white was taken April 28 and the one in green was taken today. Is there an improvement? My clothes seem to think so. I definitely lost some fat in the tummy area. So, what do you guys think? I feel a bit lighter. Or maybe that's just air that went out of my head? Haha. I have learned to love hot tea and so I've been drinking a lot of it now. I am no longer starving myself but I have limited on stuff that I shouldn't be eating. I hope to post another update in 1.5 months again and I hope that I'd have shed more pounds and not gained anything since I will be working starting Monday and it will be on a graveyard shift. 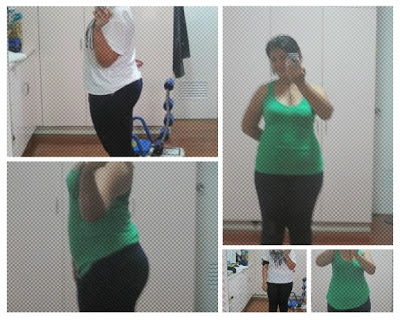 So there, that's my update on my quest to losing weight. Yep yep. Agree. More running, walking, and boxing I think. Seriously kht ako need ko n mag diet! Hindi lang ikaw! Hahahahaha! And im patiently waiting for my new running shoes hahaha! Just ordered yesterday..yes you loose some weight and your good to go! Tea really helps and take note of your food intake. Hahahaha! I gained mine 8 years ago and it hasn't disappeared since.